We are very excited that BusOnlineTicket.com has teamed up with Economy Express to provide online booking for their bus tickets. Through the partnership between BusOnlineTicket.com and Economy Express, our customers would be able to enjoy the convenience of 24/7 online booking. Economy Express is one of the popular express bus companies in Malaysia with offices based at Kulim and Kuala Lumpur. Buses deployed by Economy Express are fully equipped with air conditioning system, reclining seats, spacious legroom, charging ports and televisions to ensure their passengers can have a pleasant bus journey. The pick-up points and drop-off points in Kuala Lumpur are located at Terminal Bersepadu Selatan (TBS), Kajang or KL Sentral while the pick-up point and drop-off point in Kulim is located at Kulim Bus Terminal. The bus fare between Kuala Lumpur and Kulim is reasonably priced from RM 37.00 per way. 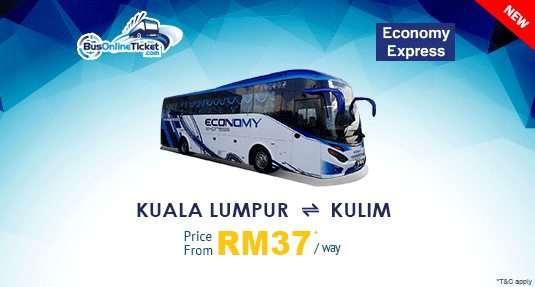 Begin your journey with Economy Express by booking bus ticket between Kuala Lumpur and Kulim through BusOnlineTicket.com. You are strongly encouraged to book your bus ticket online in advance to avoid any disappointment. Instant email confirmation will be sent to you once the payment is received.